A strong ensemble cast and a crafty, improvisational script make Digging for Fire a new high water mark for a filmmaker inching cautiously closer to the mainstream. For over a decade, Joe Swanberg has been a busy boy, serving as writer, director, actor, editor, cinematographer and more on various obscure shorts, mumblecore staples, and indie favorites. He’s probably best known for his role in the slasher flick You’re Next, but Swanberg’s 2013 effort Drinking Buddies earned him plenty of notice as writer/director with a refreshing voice. Digging for Fire‘s cast is full of Swanberg favorites, led by Jake Johnson, who also helped write the script. 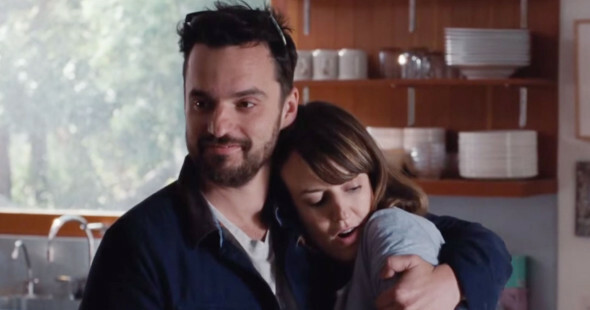 Johnson plays Tim, who is staying with his wife Lee (Rosemarie DeWitt) and their young son Jude (Jude Swanberg, Joe incredibly cute son) In a swanky house they don’t own. Lee teaches yoga in LA, and while some of her clients are away shooting a movie, Lee and her happy young family agree to house sit, where Tim promptly finds an old bone and a rusty gun while checking out the grounds. As the weekend approaches, Lee leaves the boys at home to visit her parents, and then have a girls’ nite with an old friend. Tim promises to do the taxes while she’s gone, but he can’t get his mind off of his strange discovery. Once some friends come over and beer starts flowing, seeing what other secrets might be buried in the yard starts sounding like a great idea. Both Lee and Tim find plenty of temptation in their respective adventures, and Digging for Fire becomes a quietly insightful take on managing priorities throughout the changing phases of life. Swanberg’s camera often drifts without anchor, perfect for the bevy of recognizable faces that come and go (Sam Rockwell, Anna Kendrick, Brie Larson, Sam Elliott, Orlando Bloom and more), some for only one scene. You can see why these talents are drawn to such a free-form filmmaking structure, and all are able to carve out memorable characters that influence the choices Lee and Tim are pondering. Though obvious, Swanberg’s extended metaphor is effective, as responsibilities of marriage and family clash with the yearning for lost freedom. If you keep digging for something, you just might find it, and that can be playing with fire.